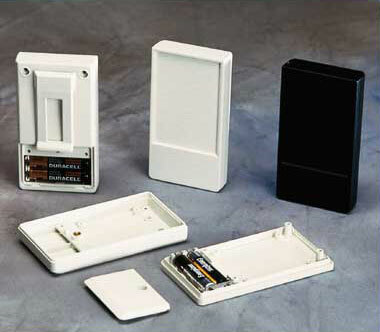 Medium-sized pocket box with optional sealing kit. Recessed control area for membrane keyboards. Screw bosses for mounting PCBs in the top and base. Battery compartment lid screwed down from the outside, for 2 x 1.5V AAA batteries. Interior space of battery compartment separated by rib. Case provided with recessed area. Black Infra-red versions permeable to Infra-red signals available. Case shells are assembled by means of 4 self-tapping screws. Mounting of the battery compartment lid by machine screw. All cases in a fine textured surface. 4.13 x 2.28 x 0.72"